Chefchaouen is hands down the most striking place I have ever visited. The perfect combination of relaxation and exploration, with rich colour and curiosities at every turn. As my bus rounded that final turn, revealing the vivid blue medina splashed across the Rif mountains, I was sold. Chefcaouen was painted blue by the Jewish refugees that lived there in the 1930’s but the hue is maintained today every spring by local residents. Not only does it keep them cool but is thought to be a spiritual color symbolic of the sky, god and heaven. The medina here is not only a striking visual smorgasbord but a haven for shoppers. You’ll find handcrafted goods not available anywhere else in Morocco alongside the your usual medina finds. Hand crafted pottery, lanterns, tagines, fabrics and candles are all abound. Great prices and a fun haggle, but dont forget these people have families to feed too! After a morning of retail therapy, its time to head back to the pool. There may be other lovely pools in town, but i found my perfect oasis of relaxation at the hotel pool at Dar Echchaouen (http://www.darechchaouen.ma/eng/) . Quiet and sunny, its only a few minutes stroll from the edge of the medina and built just high up enough on the hill to have a breathtaking view across town. The buildings are bathed in coloured glass, with clean and simple rooms. Splash out on a suite, they are situated up the hill giving you more privacy and access to the impressive views from bed. If you can stay for sundown, the view just gets better as lanterns around you are lit. Hotel staff are very accomodating with requests from food, to hookah to service at the pool to henna tattoos. Dont be afraid to ask! Don’t miss breakfast here either, very simple traditional Moroccan with a range of tasty breads, preserves, olives and cheese. Simple but delicious and served in their communal dining room, again bathed in colored glass. In Plaza Uta El- Hammam – the central square of the medina you’ll find the Kasbah entrance and bunch of great restaurants and cafes to sit in and watch the world go by. During the warmer months, pick one with a terrace and stargaze while you eat dinner. Aladdin is a favorite – the Sardine Tagine is delicious and the set menu a great deal! Inside the high ocre walls of the Kasbah is tucked a little green oasis. A pretty spot to read a book or just wander and explore. Worth the few dirhams entry, make sure you check out the artifacts in the small museum in the back corner. If wandering the medina isnt exercise enough for you, there are great options for trekking excursions through Talassemtane national Park, just outside town. You can organize a guide through the hotel when you arrive or read up more here. Or if you are up for some pampering – lots of spa options in town too! 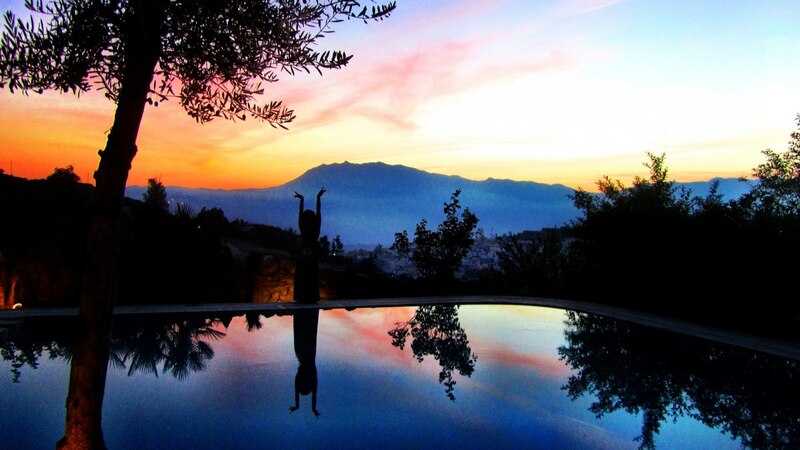 Check out the Centre Viva Form at the Atlas Chaouen Hotel. 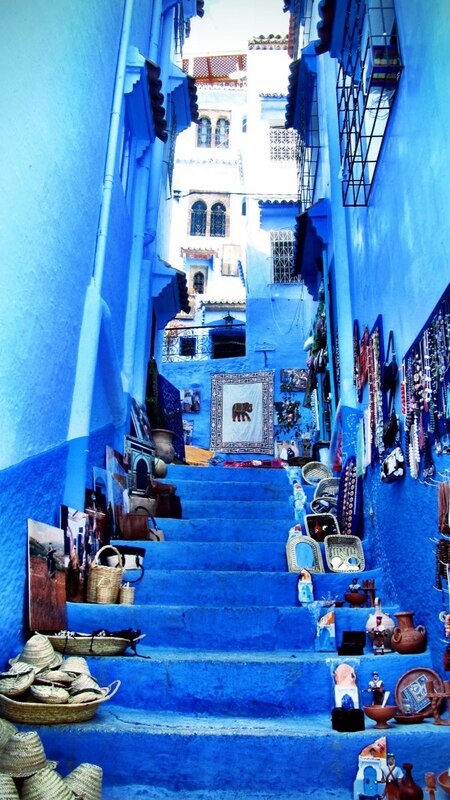 Chefchaouen is a (bumpy!) bus ride from Marrakech or Tangier. A great side trip if you are visiting the Volubilis Ruins too. And if you are happy to stay in the old medina, you feet are the only transport you will need. Enjoy! Click here for my Chefchaouen gallery. How’s life in San Fran? Be sure to let me know when you’re ever back in Melbourne. I’d love another Chinatown date some time! No plans back in Melbourne for a while yet sadly, but I promise to let you know 🙂 San Fran is great!